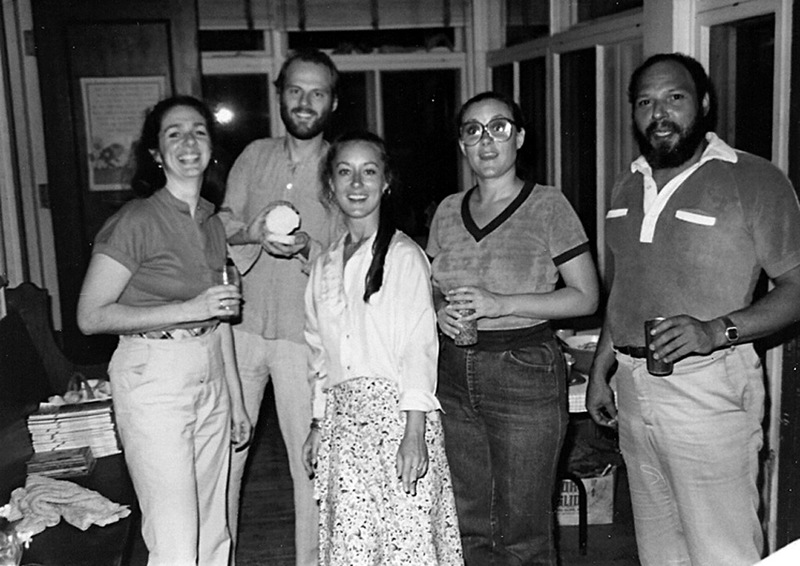 Randi Yoder, Daniel and Judith Gabriel, Judy Oliver and August Wilson celebrate future success, 1981. Tennessee Williams. Arthur Miller. August Wilson. When you list the playwrights of American theater whose work transcends all others, those three names stand at the top. Much of Wilson’s defining ten-play saga of African American life in the twentieth century, a massive undertaking with a play for every decade, was written right here in Saint Paul. That includes the first to hit Broadway (Ma Rainey’s Black Bottom) and the Pulitzer Prize winners Fences and The Piano Lesson. Penumbra Theater is in the midst of reviving the entire ten-play cycle. Penumbra brought Wilson to Saint Paul, Penumbra staged his first play (Black Bart and the Sacred Hills), and Penumbra—in the persons of Lou Bellamy, Claude Purdy, and Marion McClinton, among many, many others—nurtured and defined much of his work. But it was Saint Paul itself that provided the ground from which Wilson’s panoramic vision emerged. Wilson was not a traveler. Aside from the travels forced upon him by productions of his work, he spent his life mostly in three locations: Pittsburgh, where he was born and raised (and which provided the setting for many of his famous plays); Saint Paul, where he found his theatrical voice and ascended to the heights of Broadway; and Seattle, where he completed the last pieces of his cycle and lived his final days. 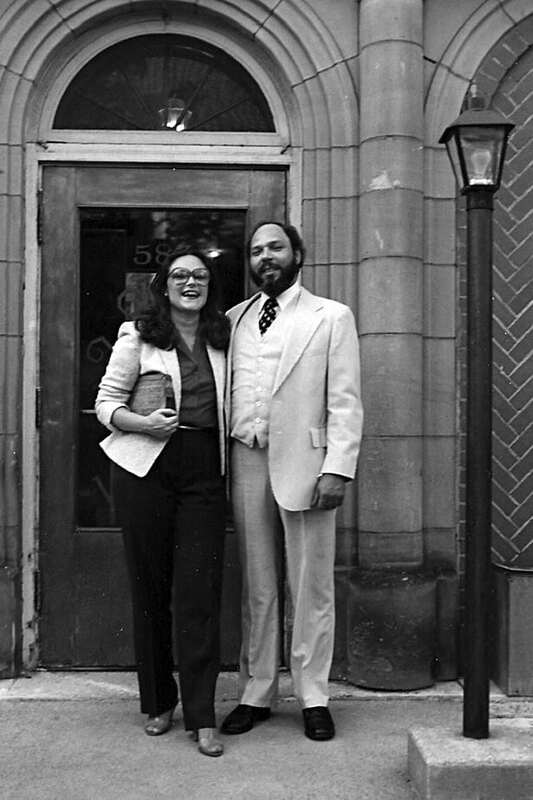 August Wilson and his fiancée, Judy Oliver, outside their Grand Avenue apartment, 1980. When I first met August in 1979, he was still writing scripts for the Science Museum and looking for a place to jump. My wife, Judith, and his fiancée, Judy Oliver, had become fast friends and were convinced that their two blues-obsessed, baseball-loving men needed to pull their writings out of the suitcase and into the light of day. Our first hook-up was at a party. I remember walking up to August and saying, “I hear you’re into Charlie Patton,” and that was all it took. We started off down the Delta and veered over into Chicago blues and then the Pittsburgh Crawfords and Hank Aaron, and four hours later the only movement we’d made was to sit down on the floor and rest our backs. The guy was fascinating . . . and completely self-taught. What he did instead was haunt the library, reading widely and deeply and following his own instincts toward what he thought he needed to know. At times, it left him with curious gaps in his knowledge—items that every school kid was made to learn might be ones he never touched upon—but by chasing his own train, he rode a whole lot further than any formal learning could ever have taken him. With August, I learned to just toss out a subject and see which hooks he took. Jorge Luis Borges . . . Romare Beardon . . . Bob Marley . . . the real story of the Johnstown flood . . . Jack Johnson and Joe Louis . . . the spot where the Yellow Dog crossed the Southern. It was all inside him, working around and seeping deep into his bones. That was to change. But in the meantime, in those early ’80s years before Lloyd Richards and Yale Rep turned up, August Wilson sat on neighborhood barstools and wobbly café chairs, smoking and brooding and, bit by bit, building stories inside him. He didn’t drive, so he walked a lot, or took the bus. A solitary figure—always in a suit and tie, dressed like a 1930s itinerant bluesman—he’d tromp the streets of Saint Paul, arguing out character conflicts in his head. Once, when he was new to town and riding the 21A, the man opposite squinted across and said, “You look like Latimer.” Who the heck is Latimer? he thought. A criminal? Someone on the lam? “Hell, I know you ain’t Latimer. I said you look like him.” Mayor Latimer would have been proud. In time, he got a job as a cook for Little Brothers of the Poor, which not only got him out of the chair at the Science Theater but freed his word flow to serve the tunes he was beginning to hum. We played together on the Little Brothers softball team and August, of course, had his own unique theory on how to hit. He corkscrewed his hands tight, and then unwound them when he swung. It didn’t always work, but when his timing was right, he generated amazing power. I can remember seeing him hit a ball over the backstop of the field beyond us, clearing both outfields and both infields. The first was when he was honing Ma Rainey’s Black Bottom and working the scene where Ma’s nephew is supposed to introduce the song, but keeps stuttering. We got to laughing so hard that August’s stuttering was real, and when he switched to Ma’s voice, we only got worse. With Fences, he was looking for a way for Troy to express his frustration over having been kept out of the Major Leagues because of the color line. August said something about how you could understand that you’re not going to supplant Babe Ruth, but what about the guy who came after Ruth? Who was he? “Selkirk, huh?” And then August launched off into an impromptu Troy Maxson diatribe—“Man hitting .269 playing right field for the Yankees! How is that right?”—that ended up almost verbatim in the script. And then he dropped into character, and I listened to the whole scene develop, with August stopping only to wonder how long watermelons would keep. Would it be realistic to haul a load of them from the south up to Pittsburgh to sell? And away he went, setting Boy Willie in motion and creating the genesis of The Piano Lesson. People like Lou Bellamy and Lloyd Richards and others were great helps to August Wilson in terms of structure and pace. But he never needed anybody to give him the language. That was all inside, like the voices of angels just waiting to sing. Did you try COMPAS? If he is not still there they should know where to track him down. When I worked at COMPAS as director of The Community Art Fund often I would see August either coming or going to what is now the Holiday Inn 7th & Kellogg where I think he did a lot of his writing during his time here. Seems odd that all that time here and all the friends we had in common, I never met him in person. In 1935, Selkirk succeeded Babe Ruth as the right fielder of the New York Yankees—and also inherited Ruth’s fabled No. 3 uniform (which was not retired until 1948, the year of Ruth’s death). Over the next eight seasons, Selkirk batted over .300 five times, twice drove home more than 100 RBIs, played on five World Championship teams (1936, 1937, 1938, 1939 and 1941), and made the American League All-Star team in 1936 and 1939. Selkirk is mentioned in August Wilson’s 1987 Pulitzer Prize-winning play, “Fences.” The protagonist, Troy, confident that he can do better than white ballplayers in the majors, alludes to Selkirk and his .269 average.